I suppose I’ve had an on again off again relationship with the semicolon; it really comes in handy when two thoughts are similar and there’s no need for two separate sentences. I have become a natural at using it and have improved my writing in great ways. This little mark that is a comma with a period over it used to baffle me, but it is now truly embraced. Me and semicolon starting dating a few years ago and have shared a couple of interesting sentences under candlelight together, many of them making me look highly intelligent and scholarly. I chuckle a little whenever I employ the use of this weird mark – it barely gets any spotlight and is not particularly loved by novice writers. It gets a chance to shine in poetry though. Now, the exclamation point is one mark I have generally shied away from. I use it very sparingly in writing, because the overuse of it tends to make the passage come off as silly and immature, and I DON’T WANT TO LOOK LIKE I’M YELLING! I think of the exclamation point as a period with a tall hat on, like a bishop. My general rule is that it should not be used more than five times, one or two times in a paragraph, but that of course is objectionable. Cut out all these exclamation points…An exclamation point is like laughing at your own joke. Me and the full stop or period go a long ways back…way, way back. It’s the one mark that can’t be ignored and is basically the cornerstone of all punctuation. If there wasn’t any such thing as a period, sentences would never end or we’d have to find a more unconventional way to show the ends of sentences, such as creating every sentence on a new line, though there are ways now of using emoji but only in the informal world of Twitter and Facebook – and that would just make blogs and everything else look like the websites of children. 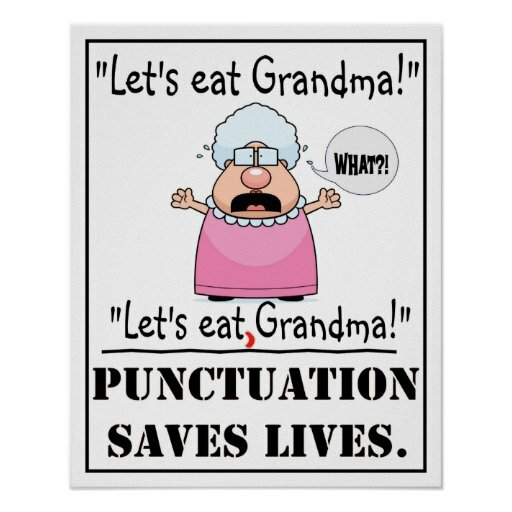 The comma is also an important part of everyday writing, the difference between telling you want to eat someone and telling you want to eat with someone. Do you like my clever pun on the word “punctuate” in the title? Like the saying “I eat punks like you for breakfast”? We all have strange relationships with punctuation — do you overuse exclamation marks? Do you avoid semicolons like the plague? What type of punctuation could you never live without? Tell us all about your punctuation quirks! Nicely done. I tend to overuse exclamation marks myself. Shall put a stop to that. (no exclamation mark though I was ready to hit the button).